AuthenticPlays Reviews - Is AuthenticPlays Reliable or Another Scam? AuthenticPlays says they offer only genuine Facebook likes from real users. Their largest package provides only 6,000 likes, which is significantly smaller than those offered by other sites. Their prices are a bit higher, giving you less value for your money. They don’t provide any detailed information about the kind of users who will be liking your page, casting doubts on the overall quality of their service. They do offer a money-back guarantee for undelivered orders, but don’t provide additional information on how it works. There is no retention warranty for dropped likes. To make matters worse, the site’s customer support team did not respond to our questions about these issues. We highly suggest you find better services and prices by going through our list of Facebook Likes providers which perform well. AuthenticPlays is a social media promotions company that was started in 2009. They provide different Facebook likes packages, which are looked at in this review. You can also get services for other platforms like Twitter Followers, YouTube Views, and Instagram followers. The site claims to offer only real and organic Facebook likes at affordable prices. They say that their service will be able to provide the needed momentum to increase the growth of your Facebook page. The company adds that your page can gain more SEO value with their service, increasing your page’s visibility. 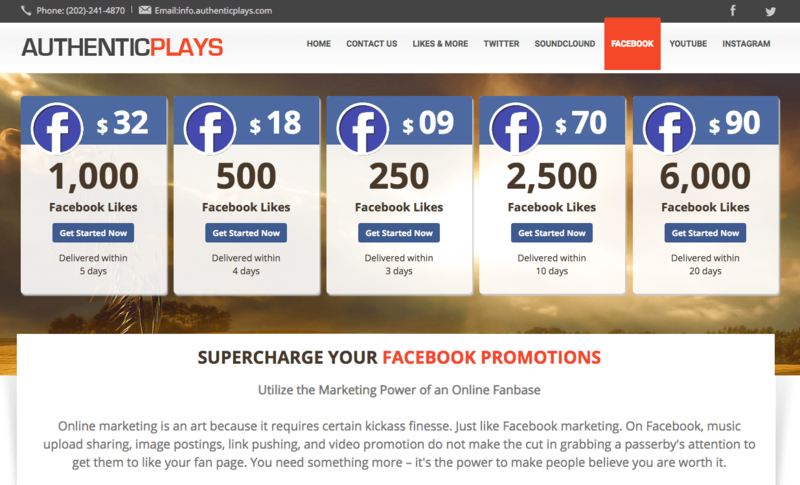 AuthenticPlays offers five different Facebook Likes plans, ranging from 250 to 6000 likes. The delivery time for these packages varies from 3 to 20 days. To buy one of their Likes packages, you need to provide your Facebook page URL and email address. The site uses Paypal as their main mode of payment. AuthenticPlays does not have a dedicated Terms and Condition page on their site. You can find a few mentions of their practices but these give very little details. According to the company, they use content blockers to deliver your Facebook likes. These blockers require people to like your page so they can view certain content. AuthenticPlays claims to offer a 100% money-back guarantees on orders, but there’s no information provided on how you can get these refunds. There is no stated retention or replacement policy on AuthenticPlays’ site for lost likes. 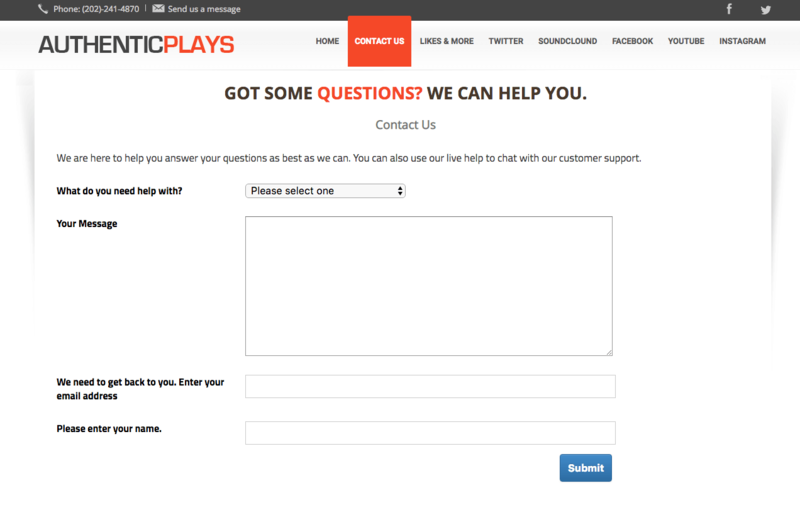 AuthenticPlays has a standard live chat panel on their site. Despite their claims of 24/7 customer support, the live chat is not constantly online. Other customer service options you have are their on-page contact form, an email address (info@authenticplays.com), and a phone number (202-241-4870). Their staff didn’t respond to the questions we sent through these channels. AuthenticPlays’ Facebook likes packages are the smallest offers we have encountered on the market, going up to only 6,000 likes. Their prices are also higher than other providers on average. This makes them less cost-effective than others and not something that we would recommend. You can find better deals and prices from our list of the best Facebook likes providers on the market. AuthenticPlays says that they will be able to deliver as many as 250 likes in three days. An order of 6,000 likes would take about 20 days. Considering the sizes of the packages that they offer, these delivery times are slower than other providers. 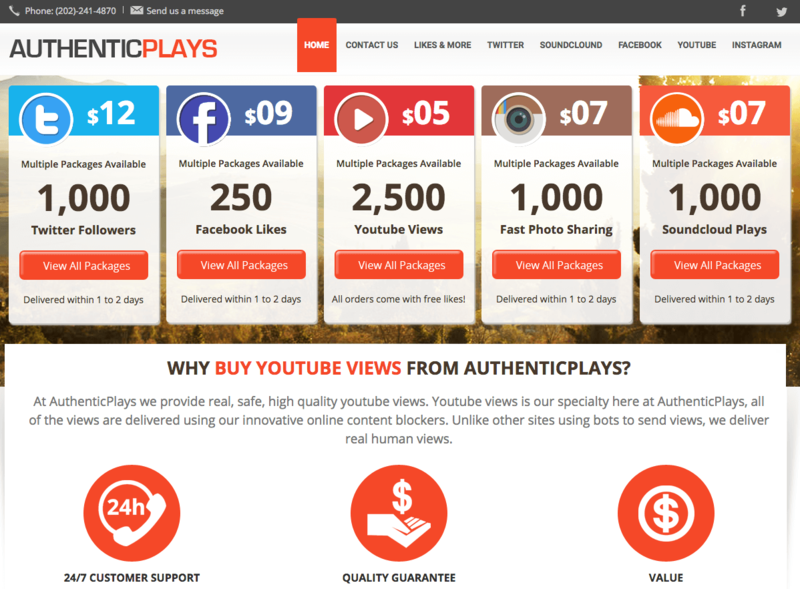 AuthenticPlays says they use content blockers to encourage people to like your page. This means that the likes are from real users. The site does not provide examples of these users, making it hard to gauge the actual quality of the likes you will receive. While the site claims to provide high-retention Facebook likes, AuthenticPlays does not give additional information on actual retention rates. Since the site also doesn’t offer a replacement guarantee, you will find yourself without a cushion in case of lost likes. AunthenticPlays fell short of our expectations. The sizes of their packages are smaller than other providers while the prices are higher, providing less value for your money. The quality of the likes you will be getting is also dubious as the site doesn’t provide much information about their procedures or the accounts that will like your page. The assessment is made worse by the underwhelming customer protection policies they have. While they claim to provide a 100% refund guarantee, they don’t provide instructions on how to claim it. In addition, they don’t offer replacements for dropped likes. Their customer support is also unresponsive, despite having multiple channels for communications. With these issues, we don’t recommend purchasing Facebook likes from AuthenticPlays. You can find more reliable options by checking out our list of highly-trusted Facebook Likes providers.